Transport anywhere in what can be considered a third world country is quite a challenge to anyone used to online booking of easyJet flights. But… if you’ve arrived with Western wealth then it’s never going to be all that bad either. I mean for sure, your chances of arriving on time are little better than taking a train in the UK, but neither are you going to be sharing your personal space with a chicken and three donkeys in the back of a truck. Not unless you’re especially keen on travelling on extreme lean budgets – which if you are, you won’t be in Cuba anyway. Travelling on a tight budget in this country is surprisingly tough thanks to the split economy. 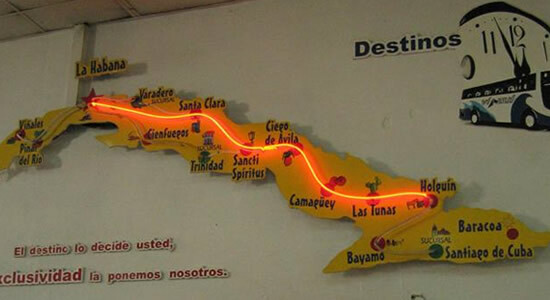 If you’re staying long enough and have a good command of Spanish you can buy and use Cuban Pesos as opposed to the tourist money – the Cuban Convertible Peso (or CUC for short) – but you’ll find that unless you can prove you’re Cuban you won’t necessarily get the low prices that locals might enjoy. You’ll also not be allowed in many trucks, taxis and buses where carrying foreigners is illegal. It makes sense – if rich tourists are going to turn up, you want them to help your economy along. If they go round spending thruppence-ha’penny a day they’re doing bugger all to help. And you don’t want poor tourists anyway – they smell bad, make the place look untidy, and bang on about getting to be one with the locals. Which usually involves trying to find out what drugs they’ll sell them, and then taking them. Fair enough, really – but Castro needs money coming into his country more than anything else. So you’re going to end up spending the equivalent of about 1USD for every ten kilometres travelled – several times what you’ll spend in Peru for example. There are plenty of intermediate stops too – check out their website for more information, prices and times. Viazul’s coaches tend to leave on time, are reasonably clean (but on a bad day the toilet might smell worse than Swampy) and generally comfortable. Take warm clothes though because given air conditioning Cubans will run it at maximum. The information we had was not to bother. So we didn’t. Which means I can’t really do any more than pass that information on. Apparently they’ve improved a bit, with some new rolling stock from France, but it’s still an unreliable and slow way to travel. Again, we didn’t use any, but there are planes connecting some of the major centres, and prices don’t seem to be too bad. Car hire isn’t cheap, but if you want to get to some out of the way places it can be a great way to travel as the roads are largely empty. You can also pick up plenty of hitch-hikers. The smell might be bad when you discover they’re carrying an enormous fish they just caught. But otherwise it can be an interesting way to meet locals. Obviously, the usual caveats apply – if a guy is standing there foaming at the mouth, holding a large machete, and dressed in bloody rags then it might be best to drive on. It’s not all perfect though – some roads simply disappear into dirt-tracks with no notice, there are bridges that they clearly lost enthusiasm for part-way through (blame the fall of communist Russia for that one), and pot holes that will swallow your car whole. And if you drive at night you’ll be able to play chicken with unlit cars, horses, and, erm, chickens. Taxis should be relatively affordable, and most are metered. If they’re not, they probably aren’t allowed to take foreigners on board and will be taking a risk carrying you – especially in more heavily policed areas and they may ask for payment in advance of any risky places, or will drop you off before checkpoints at which point you’ll have to walk past and possibly find someone else to carry you. 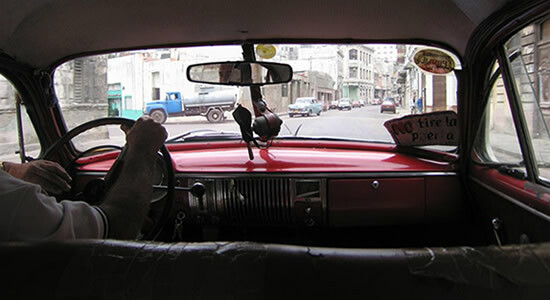 Almost anyone will act as a taxi in Cuba, so be careful, and check prices in advance of getting in. Most drivers are chatty and interested in you, and some of the classic cars in use are beautiful – though they won’t sound it as they often run on old Japanese diesel engines rather than big tasty V8s. I mean… just don’t. If you could afford to fly to Cuba you can afford not to take chances with your life and health. Having said that, it’s about the only way to get to some places if you can’t afford a hire-car or taxi and don’t feel like hitching. Queues are managed by men in yellow outfits, known as ‘Amarillos’. They will make sure you go to the right place, but may not allow foreigners on board. A tip may work wonders…. You’ll need Pesos, not CUCs, and a strong backside. 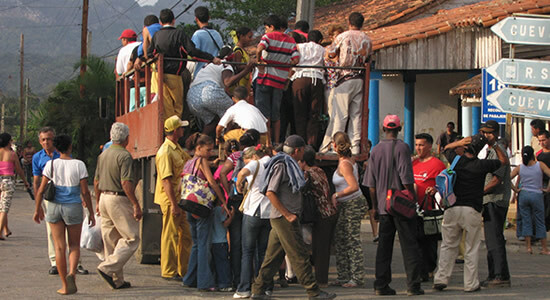 Overall, Cuban public transport is limited and can be quite pricey for tourists, but stick to the main routes and you’ll be fine on relatively good metalled roads. Only if you visit more remote locations will you find the need to get inventive.